Blurb An industrial spacish texture pack. And here, probably the last texturepack I will release of Yves Allaire's texturepacks, because the other texturepacks aren't that great as those which I already putted on quadropolis. The original textures are created by yves allaire, while the bump- and specular-maps are created by me. This texturepack can be used very well for a capture the flag map which is space-like themed, but can be used for a deathmatch map either. I hope you enjoy the textures! 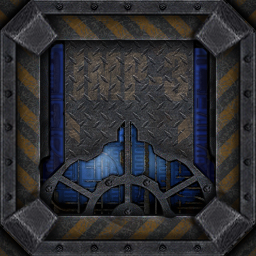 I would like to thank Yves Allaire for his wonderful work for recreating some of Quake3's textures. The original textures can be found on http://www.evillair.net/v3/. Don't include these textures within your zip-file of your project, but rather link to this page instead. If you are using modified versions of the textures; be sure to include those and pick another name for them. It currently is licensed as Creative Commons BY-SA 4.0. - Added meshes for some textures which are containing an alpha-channel. - Added the skins of the meshes into the regular texture pack as well, just as option. - Redid all the bump- and height-mapped textures. - Rearranged the whole set on alphabetic order instead of theme (the order you see in the directory is what you get ingame). - Tweaked the shader-settings to be more smooth then previously. - Added the advanced technique of textureblending for those who are interested in using multiple layers (like using several glow-mapped textures in this case). - Reconfigured all of the models. id have to give a 10/10 :D i tested them and they have many applications.